Marano family of Cordova or Seville, several members of which were victims of the Inquisition in Spain and South America, while several others settled in Turkish territory. Chief rabbi at Jerba, where he died after 1761; pupil of Nissim Ḥayyat. He wrote a somewhat mystical commentary (written in 1738) on the Pentateuch, which appeared, together with interpretations of certain passages of the Prophets and the Hagiographa and some sermons, including two funeral orations, under the title "Bigde Aharon." This likewise appeared in a volume which included also the "Mishḥat Aharon," a commentary on the Talmud, and the "Miktab le-Ḥizḳiyahu," a Biblical commentary by his son Hezekiah Perez, and which was published at the expense of his grandson Maimon Perez (Leghorn, 1806). Aaron composed also liturgical poems; and some of his piyyuṭim were printed at the end of the "Miktab le-Ḥizḳiyahu." Zedner, Cat Hebr. Books Brit. Mus. p. 629. Rabbinical author; lived at Constantinople in the beginning of the nineteenth century. He was the author of a volume of novellæ on the Talmud, as well as on Maimonides and other medieval rabbinical authors, to which is added a work on the laws of ṭerefah by Raphael David Mizraḥi. 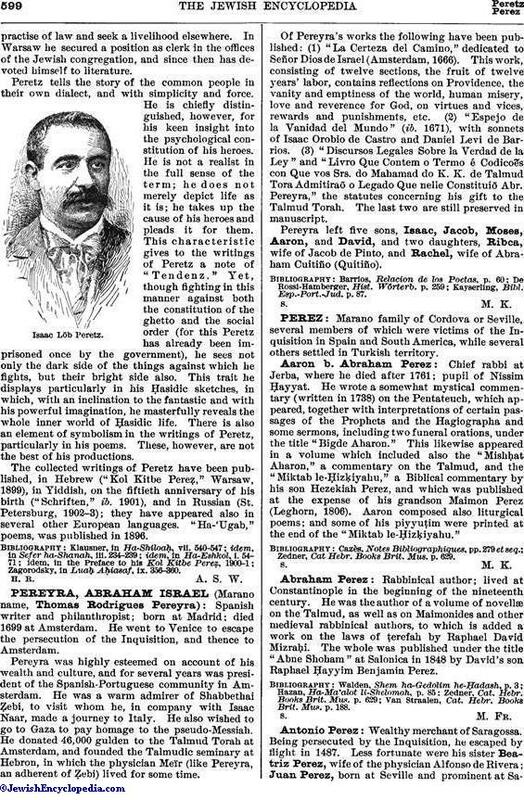 The whole was published under the title "Abne Shoham" at Salonica in 1848 by David's son Raphael Ḥayyim Benjamin Perez. Van Straalen, Cat. Hebr. Books Brit. Mus. p. 188. Wealthy merchant of Saragossa. Being persecuted by the Inquisition, he escaped by flight in 1487. Less fortunate were his sister Beatriz Perez, wife of the physician Alfonso de Rivera; Juan Perez, born at Seville and prominent at Saragossa;and Leonor Perez, wife of Garcia Lopez. All of these were publicly burned at Saragossa as "Jewish heretics," the first-named on March 21, 1485, the second on Nov. 7, 1487, and the last-named in March, 1487. Preacher of the eighteenth century. His ancestors lived in Castile; but on the expulsion of the Jews from Spain the family, which was very wealthy, settled in Morocco. 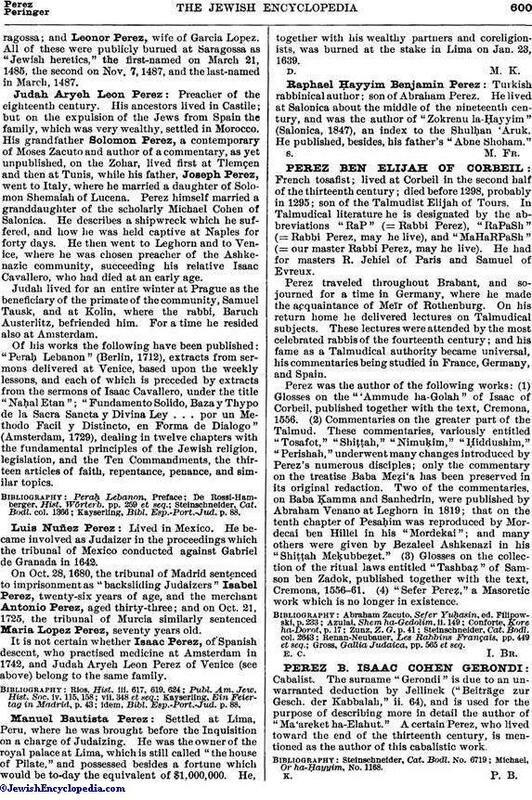 His grandfather Solomon Perez, a contemporary of Moses Zacuto and author of a commentary, as yet unpublished, on the Zohar, lived first at Tlemçen and then at Tunis, while his father, Joseph Perez, went to Italy, where he married a daughter of Solomon Shemaiah of Lucena. Perez himself married a granddaughter of the scholarly Michael Cohen of Salonica. He describes a shipwreck which he suffered, and how he was held captive at Naples for forty days. He then went to Leghorn and to Venice, where he was chosen preacher of the Ashkenazic community, succeeding his relative Isaac Cavallero, who had died at an early age. Judah lived for an entire winter at Prague as the beneficiary of the primate of the community, Samuel Tausk, and at Kolin, where the rabbi, Baruch Austerlitz, befriended him. For a time he resided also at Amsterdam. Of his works the following have been published: "Peraḥ Lebanon" (Berlin, 1712), extracts from sermons delivered at Venice, based upon the weekly lessons, and each of which is preceded by extracts from the sermons of Isaac Cavallero, under the title "Naḥal Etan"; "Fundamento Solido, Bazay Thypo de la Sacra Sancta y Divina Ley . . . por un Methodo Facil y Distincto, en Forma de Dialogo" (Amsterdam, 1729), dealing in twelve chapters with the fundamental principles of the Jewish religion, legislation, and the Ten Commandments, the thirteen articles of faith, repentance, penance, and similar topics. Kayserling, Bibl. Esp.-Port.-Jud. p. 88. Lived in Mexico. He became involved as Judaizer in the proceedings which the tribunal of Mexico conducted against Gabriel de Granada in 1642. On Oct. 28, 1680, the tribunal of Madrid sentenced to imprisonment as "backsliding Judaizers" Isabel Perez, twenty-six years of age, and the merchant Antonio Perez, aged thirty-three; and on Oct. 21, 1725, the tribunal of Murcia similarly sentenced Maria Lopez Perez, seventy years old. It is not certain whether Isaac Perez, of Spanish descent, who practised medicine at Amsterdam in 1742, and Judah Arych Leon Perez of Venice (see above) belong to the same family. idem, Bibl. Esp.-Port.-Jud. p. 88. Settled at Lima, Peru, where he was brought before the Inquisition on a charge of Judaizing. He was the owner of the royal palace at Lima, which is still called "the house of Pilate," and possessed besides a fortune which would be to-day the equivalent of $1,000,000. He, together with his wealthy partners and coreligionists, was burned at the stake in Lima on Jan. 23, 1639. Turkish rabbinical author; son of Abraham Perez. He lived at Salonica about the middle of the nineteenth century, and was the author of "Zokrenu la-Ḥayyim" (Salonica, 1847), an index to the Shulḥan 'Aruk. He published, besides, his father's "Abne Shoham."